The Official Distributor for Zummo, throughout the UK. Zummo Machines to Buy, Free-on-Loan Services, Installation, Spares, Repairs & Maintenance. Zummo London cover it all. Official UK Distributors of the Best Juicer Machines on the Market! Here at Zummo London we offer a range of commercial fruit juicing machines that supply copious amounts of fresh citrus juice for customers at the click of a button throughout the UK. Our fast and reliable services offer the delivery and installation of a Zummo machine that’s equipped to your needs. Our team also cover the aftercare package of repairs and spares for your machine to ensure your Zummo machine will never run dry of orange juice any day of the year. Whether you run a bar, health-club, gym, restaurant or even an event anywhere throughout the UK, try Zummo, your customers will be coming back for more. Our latest customers include The Chiltern Firehouse, The Ned, The Connaught, Annabel’s, The Lanesborough and Novikov. Serving some of the capital’s top hotels and restaurants, our machines are famous for serving the best, freshest juice. We offer a free-on-loan service that works perfectly so that you skip the upfront cost of the commercial machine. From the *NEW* Zummo Nature Range, the Zummo Z40 Nature N Adapt is one of the most versatile machines to date. Offering Self-Service and Manual functionality, it’s considered the best juicer machine within the current market and is the fastest juicer machine available. 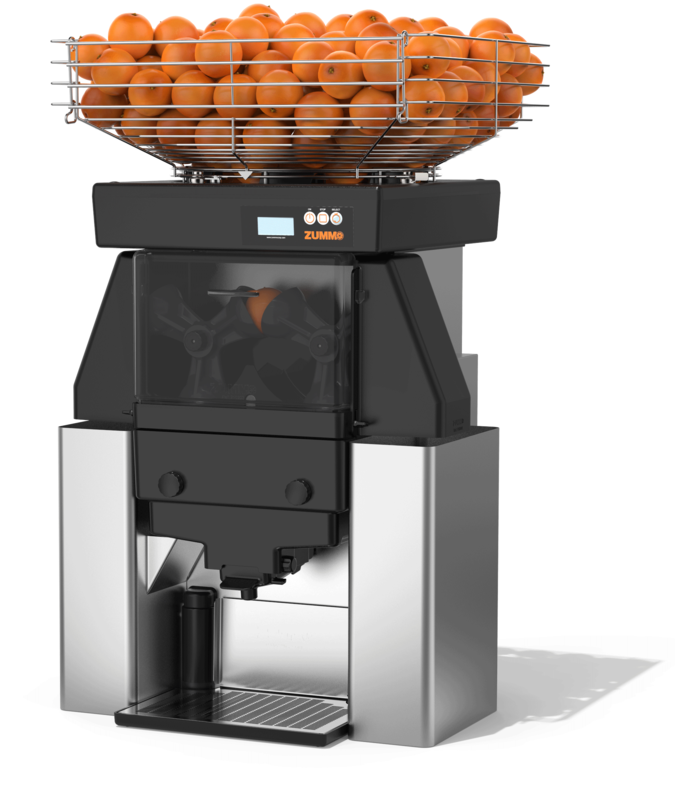 Able to juice an astonishing 3 litres of 100% pure orange juice in just 60 seconds, this is the perfect machine for the fast-paced hotel and events industry. The Z40 range includes the new Adapt tap tray as standard equipment. The tap is activated like a swing lever, making it easier to use. It has two positions: continuous mode or tap mode. With this new design, the juice flow volume is greater and total discharge is guaranteed, avoiding accumulations in the bottom of the tray. The New Zummo Z40 Multifruit Juicing Machines from Zummo London: The super-fast juicer the hospitality and food retail industries have been waiting for! The new Zummo Nature range offers Advanced Efficient Vertical Systems. Increased durability: optimum operation of the blade is guaranteed and problems arising due to damaged rubber bands no longer exist. Increased functionality: maintenance tasks, such as replacing broken or worn rubber bands, are avoided. Therefore, cleaning the juicer is even easier & Increased profitability: up to an extra 10%. Zummo has developed the Auto Cleaning System, based on an automatic cleaning filter, which is standard on Nature models Z06, Z14 and Z40. How does it help your business? More autonomy: You will be able to focus on other tasks, since you will not have to worry about cleaning the filter of your squeezer more than once a day & Increased profitability: The automatic filter always remains clean, without accumulated pulp, so that, not a drop of juice is wasted when going through it. We've just won the award!